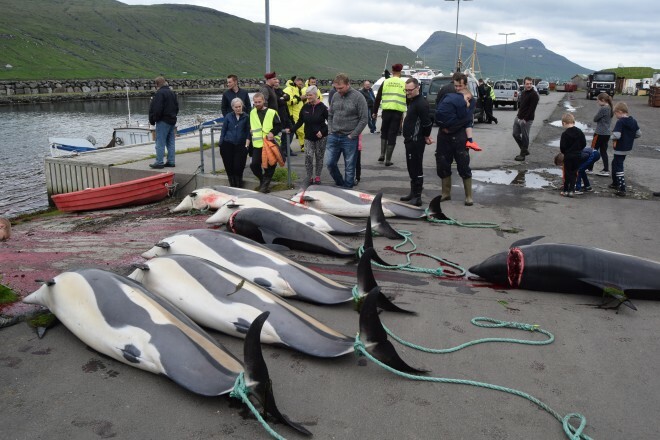 Sadly, Faroese whalers have conducted three whale kills in the past month. 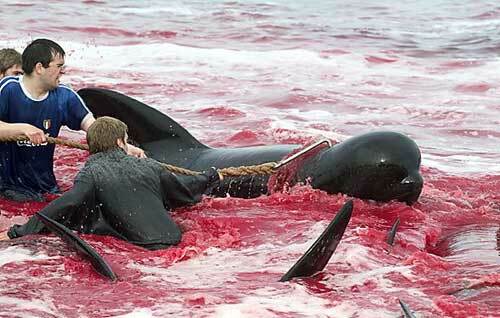 On May 21st, 83 pilot whales were killed at Bøur on the island of Vagar near the airport. 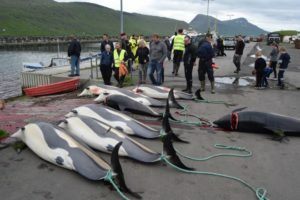 On June 16th, 164 pilot whales whales and 8 whitesided dolphins were killed near the Faroese capital of Thorshavn and just a couple of days ago, on Monday 26th June, a further 150 pilot whales were slaughtered at Hvalvík. Shockingly, a pod of 15 white-sided dolphins was also driven ashore and killed that day. This week’s killings makes a total of 397 pilot whales and 23 dolphins slaughtered this year so far. In 2016, there were five whale drives and a total of 295 pilot whales killed. An average of 800 pilot whales are killed each year with over 5,000 pilot whales, 680 dolphins and 18 bottlenose whales killed since 2008 when Faroese health leaders warned that toxic pollutants, like mercury and PCBs, that concentrate in the whales’ meat and blubber make it no longer safe to eat. These toxic pollutants are known to impact on the nervous, immune and reproductive systems and are linked to a high incidence of health problems in the Faroese population effecting cognitive development and function, foetal development, Parkinson’s disease as well as arteriosclerosis, hypertension (high blood pressure) and type2 diabetes. Campaign Whale was led to believe that dolphin hunting was banned after 420 dolphins were killed at Hvalba with small knives in a shockingly cruel hunt in 2013. The return to the killing of dolphins this year is very sad news indeed. New whaling regulations mean that whales are driven by boats to killing bays where blunt ended steel gaffs are used to drag the whales into the shallows. There a spear is driven deep into the back of the neck to sever the spinal chord and the major arteries to the brain. However, if this fails, and reports suggest the new whaling spears do so quite often, then a small whaling knife can also be used to cut down to the arteries, semi- decapitating the fully conscious animal in the process. Entire family groups are killed in front of each other, including mothers and calves, none are spared. Campaign Whale is working with Faroese colleagues to end whaling and promote whale-watching instead. Unfortunately, tradition dies hard, but sooner or later the Faroese will have to accept that killing large numbers of these intelligent, social animals to produce toxic meat and blubber they shouldn’t eat, simply makes no sense. You can help our campaign by donating to our special campaign fund or buying our special merchandise. All proceeds go to our work in the Faroes. Further details can be found here. Thank you!